My wife Donna enjoys keeping Christmas as well as any soul alive. Given her way every nook and cranny would contain some type of Christmas decoration. I have not been much inclined to help her with this for quit some time. In fact as the years go by her desire to decorate seems to increase while my own is diminished. Now when the family comes around for Thanksgiving she cajoles them into getting things out and starting the preparations by applying all of the wiles and ways know only to a mother. The last few years her primary elf has been our daughter Ellisa. So while she was here Ellisa, in what is becoming a new tradition, got the tree up with no small measure of help from 5 year old Payton. When they departed our family left the boxes of Christmas items scattered around my home office. Since then the collection of items that Donna has found and drug out has continued to grow daily. As I think back on Christmas over our years together I am reminded of several things. Our first Christmas together was in Eritrea where we met. I was stationed at Kagnew Station, an American Army base, where she had been hired to teach at the school for military family's. We had been dating for several months when she decided to use her Christmas break time to go on an East African Safari. On Christmas day I was celebrating with several friends when she walked in looking for me. She had cut her trip short to be with me on Christmas. That was a real epiphany for me as I came to realize how much she cared for me. We were married the following July. The home we shared there was typical in many ways to those occupied by middle class people throughout the world. We had a household maid and a security guard. Both of these household workers are considered very necessary to protect your property from theft, damage, and other harm . Two notable features are worth mentioning. First there were the hot water heaters... we had a small propane "Hot Water On Demand unit" providing hot water at the sink, and a large tank which was heated by a wood fire under it to use for larger jobs such as laundry and bathing. The second item was a tree in the back yard. 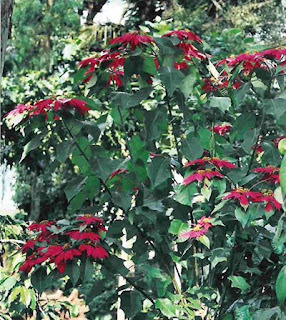 It was about the size that you would expect for a fruit tree but it was a Poinsettia. That's right a Poinsettia tree. We were near the equator at an altitude in excess of 7000 feet, the resulting weather was very moderate, so the thing just kept on growing and blooming and growing and blooming and growing and blooming. 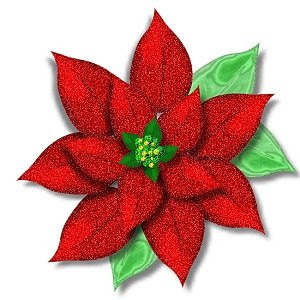 Now I can't see a Poinsettia without thinking of that one. Call me nostalgic, but I love reading your memories. I have always said I should have lived those times! :) I love it when you tell stories I've never heard! How great of mom to come to you on Christmas. Makes me all wishy-washy.